Bad news about U.S. policies regarding Cuba continues to accumulate. The U.S. refuses to budge from outdated hostility towards the island nation when the U.S., in my opinion, should be pursuing reconciliation with Cuba. One glimmer of hope for rationality on this subject was provided by William M. LeoGrande and Peter Kornbluh in The Nation magazine. First, on September 5, 2014, President Obama issued a terse memorandum to the U.S. Secretary of State to extend for another year or through September 14, 2015, the application of the U.S. Trading with the Enemy Act to Cuba for another year. This statute, which was enacted during World War I in 1917, gives the President authority to prohibit, limit or regulate trade with hostile countries in times of war. It is a statutory foundation on which the entire range of U.S. sanctions toward Cuba rests. In a statement for the Secretaries of State and of the Treasury, Obama labeled the move “in the national interests of the United States” without any explanation. On September 8th Cuba denounced this decision. Cuba said the main goal of the embargo or blockade is to cause “harm and suffering” to the Cuban people” despite the embargo’s having been denounced by the U.N. General Assembly on 22 consecutive occasions since 1992. Second, as anticipated Cuba has announced that on October 28th it will offer at the U.N. General Assembly a new resolution on the need to end the U.S. blockade against Cuba. A Cuban report in support of the resolution stresses the blockade has been described as a genocidal policy by the international community since it prevents the island from acquiring medicines, reagents, spare pieces for medical equipment and other inputs, forcing it to trade with distant markets, thus increasing the costs. The Cuban report also alleges that the embargo/blockade has caused $116.8 billion of damages to the island’s economy. Once again, this resolution is expected to be overwhelming approved by the General Assembly. Fourth, Alan Gross, a U.S. citizen, remains in poor health in a Cuban prison after his conviction for violating Cuban laws. In my opinion, it clearly is in the interest of both Cuba and the U.S.to have him released from that prison and returned to the U.S. before he dies and thereby creates another obstacle to improving relations between the two countries. Cuba, however, by all reports is trying to negotiate an exchange of Gross for at one or more of the three remaining “Cuban Five” in U.S. prison. Frank Calzon, the Executive Director of the Center for a Free Cuba, however, has issued what, in my opinion, is a counterproductive suggestion. He says, “There . . . comes a time when something more [than negotiating through diplomatic channels] is needed. That time is now in Cuba. Only when U.S. government raises the stakes — the political and economic risks facing Cuba — will Alan Gross be allowed to come home, and only then will Havana have to think twice before taking another hostage. Kissinger instigated this planning because he personally was infuriated that Fidel Castro in late 1975 had sent Cuban troops to newly independent Angola to help in its repelling attacks from South Africa and right-wing guerrillas and thereby ignored Kissinger’s behind-the-scenes effort to improve U.S. relations with Cuba. These revelations are in documents, now available online, that recently were declassified by the Gerald R. Ford Presidential Library. 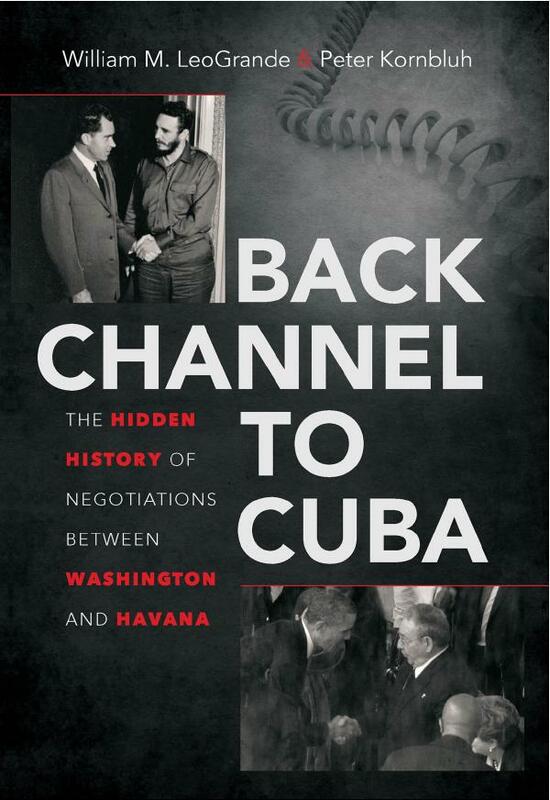 William M. LeoGrande (Professor of Government at American University’s School of Public Affairs) and Peter Kornbluh (Director of the National Security Archive’s Cuba and Chile Documentation Projects) have published a new book, Backchannel to Cuba: The Hidden History of Negotiations Between Washington and Havana, which I want to read. This book forms the basis for their recent article in The Nation magazine, Six Lessons for Obama on How to Improve Relations with Cuba. Here are those lessons. Even at moments of intense hostility, there have always been reasons and opportunities for dialogue. Cuban leaders instinctively resist making concessions to US demands, but they are willing to take steps responsive to US concerns so long as those steps come at Havana’s initiative. Cuban leaders have had a hard time distinguishing between U.S. gestures and concessions. Domestic politics is always an issue on both sides. Cuba wants to be treated as an equal, with respect for its national sovereignty. Although I do not have the depth of knowledge of LeoGrande and Kornbluh I endorse their lessons as should be evident from this blog’s many posts on the subject of U.S.-Cuba relations. Perhaps the bold stroke they mention as the way towards improved relations could be made by a third party—another country or an international organization or a nongovernmental organization—stepping forward with a public announcement of a desire and commitment to serve as a mediator to resolve the many issues between the two countries and inviting them to send representatives at a set time and place to discuss the procedures for such a mediation. Such an initiative, in my judgment, to have any chance of success would have to be by an entity that was neutral, that was respected by both sides and the world at large, that had the resources to be engaged in such a process for a long time and that would not be discouraged by any initial negative responses by either country. This blog made such a suggestion in 2011 and 2012. Such a mediation would remove the desire of at least the U.S. to avoid taking the first step toward normalization. It also, in my opinion, would be in the national interest of both countries. A rebuttal to the Menendez letter was issued by the Center for Democracy in the Americas. LeoGrande and Kornbluh have been interviewed about the book. Comment: U.S. Now Willing To Accept Cuba at Summit of Americas? Associated Press, US official downplays Cuba’s invitation to summit, Wash. Post (Oct. 9, 2014), http://www.washingtonpost.com/world/the_americas/us-official-downplays-cubas-invitation-to-summit/2014/10/08/e72537f6-4f49-11e4-877c-335b53ffe736_story.html.